The phenomenon of concomitant tumor immunity involves a tumor-bearing host rejecting another similar tumor at a distant site and suggests the existence of tumor-specific immunity. Loss of this immunity may contribute to tumor metastasis. However, mechanisms underlying the loss of concomitant immunity are largely unknown. We set up a concomitant tumor immunity model in which this immunity is gradually lost as the primary tumor progresses. We found that CD8+ T cells, especially tumor-infiltrating CD8+ T cells, from mice that lost concomitant tumor immunity, possessed potent antitumor properties and strongly expressed effector molecules. Furthermore, effector/memory regulatory T cells (Treg cells, CD103+CD4+Foxp3+ T cells) increased as the primary tumor progressed. They initially accumulated around the tumor and in the spleen at later points. Not only did these cells more greatly express killing molecules, they also suppressed the functions of tumor-bearing CD8+ T cells in vitro and in vivo. Finally, we show that these effector/memory Treg cells inhibit concomitant tumor immunity in vivo. Taken together, data suggest that effector/memory Treg cells are responsible for the loss of concomitant tumor immunity associated with tumor progression. Concomitant tumor immunity, first reported by Ehrlich (1) and Bashford et al. (2), is a phenomenon in which an immunogenic tumor-bearing host rejects inoculums of a similar tumor at a distant site, in a wide variety of tumor models (1, 2, 3, 4, 5). Nevertheless, a few investigators have found this response to be transient, as the immunity can decay as the primary tumor progresses. This phenomenon has been deemed a mechanism for tumor metastasis (4, 5, 6). In a series of elegant studies, it was proposed that concomitant tumor immunity represents a balance between tumor-induced CD8 effectors and suppressor T cells (7, 8). However, after this proposal, there was no progress made in the area for two decades, as the existence of suppressor cells was in doubt. Recent interest in suppressor T cells have led to recognition of regulatory T (Treg)3 cells, which have been shown to be the major regulators responsible for weak concomitant tumor immunity against some immunogenically inert tumors (9). However, underlying mechanisms for concomitant tumor immunity loss are still unknown. Conversely, the critical role of Treg cells in tumor immunotherapy has been gradually elucidated (10). Treg cells (defined as CD4+CD25+Foxp3+ T cells) have been shown to be inversely related to the outcomes of several human malignancies (11, 12, 13). Furthermore, depletion of Treg cells can enhance rejection of endogenous immune-mediated tumor and improve tumor Ag-specific immunity, which highlights the impact of Treg cells on antitumor immunity (14, 15). Depletion of Treg cells has also been shown to improve the efficacy of tumor immunotherapy, including vaccination and CTLA4 blockade (16, 17). Treg cells also inhibit effector functions of both tumor-specific CD8+ and CD4+ T cells through a partially understood mechanism involving cell-cell contact or production of soluble factors such as IL-10 or TGF-β (18, 19, 20). Recently, Treg cells have been subgrouped as either naive or effector/memory by their developmental stage and phenotype (21, 22). Effector/memory Treg cells are characterized by CD103 expression and the ability to home into inflammation sites (22). They have been proposed to be sentinels of tolerance, providing a first line of defense against potentially harmful inflammatory reactions (21). Treg cells have also been found in tumor tissue and as components of tumor-infiltrating lymphocytes (TILs) (23). Furthermore, the ratio of CD8+ T cells to Treg cells in TILs is highly correlated with outcomes of ovarian cancer patients (24). This correlation implies that tumor tissue might be a venue in which Treg cells impose inhibition of tumor-specific CD8+ T cells. Interestingly, tumors have also been deemed to be inflamed tissue (25). Some evidence suggests that oncogenes initiate an inflammatory program highly associated with tumor invasiveness and metastasis (26, 27). However, the relationship with tumors, antitumor immunity, and effector/memory Treg cells is unexplored. We set up a murine concomitant tumor immunity model using a CT 26 colon cancer cell line. In this model, we demonstrate that concomitant tumor immunity gradually decayed as the primary tumor progressed. Despite this loss of immunity, CD8+ T cells harvested from these mice still had potent antitumor immunity. During this period, effector/memory Treg cell counts increased not only in the TILs but also in the spleens of these mice. These cells showed greater expression of effector molecules, including perforin, granzyme B, and inflammation-related chemokine receptors. In addition, using adoptive transfer, we clearly show that these effector/memory Treg cells lead to the loss of concomitant tumor immunity associated with tumor progress. The present study indicates that effector/memory Treg cells not only inhibit immune responses for tissue protection, as in other diseases like graft-vs-host disease and chronic infection, but also protect the tumor from immune attack (28, 29). These results clarify the relationship between tumors, inflammation, and effector/memory Treg cells. BALB/c mice, purchased from the National Science Council of Taiwan (Taipei, Taiwan), were bred in the animal house of Chang Gung Memorial Hospital (Taoyuan, Taiwan) and were used in our experiment at ages 8–10 wk. All animal breeding and experiments were in accordance with guidelines of the institutional animal ethics committee. The murine (BALB/c) colon cancer cell line, CT 26, was obtained from the American Type Culture Collection (Union Biomed) and was maintained in our laboratory. Cells were regularly cultured in vitro in RPMI 1640 medium containing 10% FBS. A total of 1 × 105 live CT 26 cells (viability >95%) were harvested, washed in HBSS, and inoculated s.c. into the left flanks of naive mice (primary tumor). In cases of secondary challenge (secondary tumor), 1 × 105 live CT 26 cells were inoculated into the contralateral sides of mice that received primary injections. Tumor diameters were measured bidirectionally, twice a week. The following Abs were used for flow cytometry staining: PerCP-conjugated anti-CD4 (RM4-5), PE- or FITC-conjugated anti-CD8 (53-6.7), PE-conjugated anti-CD25 (PC61), FITC-conjugated anti-CD44 (IM7), PE-conjugated anti-CD69 (H1.2F3), PE- or FITC-conjugated anti-CD103 (M290), allophycocyanin-conjugated anti-CD62L (MEL-14), FITC-conjugated anti-CCR5 (C34–3448), biotin-conjugated anti-Fas ligand (anti-FasL, MFL3), PE-conjugated anti-glucocorticoid-induced TNFR (anti-GITR, DTA-1), PE-conjugated anti-CTLA4 (UC10-4F10-11), biotin-conjugated anti-ICOS (7E.17G9), and streptavidin-allophycocyanin, all purchased from BD Pharmingen. Also used were FITC-conjugated anti-CD127 (A7R34), PE-conjugated anti-CCR7 (4B12), FITC-conjugated anti-perforin (eBioOMAK-D), FITC-conjugated anti-granzyme B (16G6), PE-conjugated anti-lag3 (C9B7W), PE- or allophycocyanin-conjugated anti-Foxp3 (FJK-16s), isotype control rat IgG2a and rat IgG2b, all purchased from eBioscience. PE-conjugated anti-CCR3 (83101) was purchased from R&D Systems. Single-cell suspensions were incubated with appropriate Abs for staining per the manufacturer’s instructions. Stained cells were acquired from FACSCalibur (BD Biosciences) and analyzed using CellQuest software. Foxp3+ T cells were detected using the mouse Treg cell staining kit (eBioscience). For intracellular staining, cells were initially stained for surface molecules, such as CD4 and CD25, then fixed and permeabilized in the Fix/Perm buffer (according to the manufacturer’s manual) for 30 min. Cells were washed two times with permeabilization buffer and then incubated with anti-mouse Foxp3, or anti-mouse granzyme B, or anti-mouse perforin at 4°C for 30 min in the dark. Unbound stains were removed by washing twice with permeabilization buffer. Finally, stained cells were resuspended in PBS and analyzed by flow cytometry. Donor mice were sacrificed and their spleens were harvested under sterile conditions. Single-cell suspensions were prepared and CD8+ T cells were isolated using magnetic microbeads conjugated with anti-mouse CD8 (Miltenyi Biotec) by AutoMACS (Miltenyi Biotec), according to the manufacturer’s instructions. For CD4+CD25−, CD4+CD25+, and CD4+CD25+CD103+ T cell purification, splenocytes were first enriched for CD4+ T cells via negative selection using the CD4 isolation kit (Miltenyi Biotec). Enriched CD4+ T cells were then labeled with CD25-PE and CD103-FITC and sorted using FACSAria (BD Biosciences). Cell purity (>90%) for all populations was confirmed by flow cytometry. Different isolated populations of T cells were adoptively transferred into mice or used in vitro. For adoptive transfer, purified T cells in appropriate numbers were resuspended in 0.2 ml of HBSS and then injected i.v. into different mice through the tail vein. Tumors were chopped into small pieces using a razor blade and incubated with collagenase D (0.1%; Sigma-Aldrich) in HBSS for 30 min at 37°C. After passing through nylon mesh, single-cell suspension was separated with Ficoll (Pharmacia), and leukocytes were recovered from the interphase. Whole splenocytes or specific purified populations of splenic T cells (5 × 106 cells/ml) from experimental mice were restimulated in vitro by coculturing them with irradiated CT 26 parental tumor cells (5 × 105 cells/ml or 5 × 104 cells/ml) for 48 h. Supernatants were collected and assayed for IFN-γ production by ELISA according to manufacturer instructions (BD Biosciences). Mann-Whitney U test was used for statistical analyses of differences between groups. The calculations were made using PRISM (version 5.00; GraphPad Software). Differences were recognized as significant at p < 0.05. In line with previous literature involving diverse tumor systems, concomitant tumor immunity was iterated in our CT 26 colon cancer cell line induced-tumor model in BALB/c mice (1, 2, 3, 4, 5, 6, 7, 8, 9, 10). As shown in Fig. 1⇓A, the growth of secondary-inoculated CT 26 tumor cells (secondary tumor) in the contralateral side was prevented when they were injected s.c. 7 days after the first CT 26 tumor challenge (primary tumor). Interestingly, the primary tumor growth pattern was the same, regardless of secondary tumor inoculation presence or absence (Fig. 1⇓A). Loss of concomitant tumor immunity parallels with tumor progression. A, A total of 1 × 105 CT 26 cancer cells were inoculated on the flanks of BALB/c mice on day 0. On day 7, secondary tumor challenges with 1 × 105 CT 26 cancer cells were made into the contralateral flank. Growth pattern of secondary tumor (Tumor A) (▪) when challenge was 7 days after primary tumor inoculation and the growth pattern (Tumor B) (○) without previous tumor challenge as the tumor-growth control are shown (left). Growth pattern of primary tumor (Tumor C) (▪) in presence of secondary tumor challenge (right). Tumor D (○) is the growth pattern of primary tumor in absence of secondary tumor challenge. B, A total of 1 × 105 CT 26 cancer cells were inoculated on the flanks of BALB/c mice on day 0. Mice were divided into four groups, and secondary challenges with 1 × 105 CT 26 cancer cells were made into the contralateral flank on day 7, 14, 21, and 28 in groups 1, 2, 3, 4, respectively. C, Growth pattern of secondary tumor, inoculated on day 7, 14, 21, or 28. Growth pattern of secondary tumor with both primary and secondary tumor challenge (dotted line). Growth pattern of tumor in mice without previous tumor inoculation as tumor-growth control (solid line). Results are mean ± SEM for n = 5 mice in each group and are representative of three experiments. To explore this phenomenon, mice were then challenged with the secondary CT 26 tumor on different days after primary CT26 tumor inoculation (Fig. 1⇑B). As shown in Fig. 1⇑C, the secondary inoculum of CT 26 escaped immune suppression if it was inoculated 14 days after primary tumor challenge; concomitant tumor immunity almost disappeared when secondary inoculation was done 28 days after primary inoculation (Fig. 1⇑C). These results demonstrate that concomitant tumor immunity decreases gradually with time as well as with primary tumor progression. The next issue we addressed was the underlying cellular mechanism for concomitant tumor immunity loss. Splenocytes from mice that lost concomitant tumor immunity (day-28 tumor-bearing mice) were adoptively transferred to another group of mice that received first CT 26 cell tumor inoculation 6 days before. On day 7 (the next day after splenocyte transfer), the secondary inoculum was challenged to each mouse. Results show that splenocytes from day-28 tumor-bearing mice (day-28 splenocytes) could not reverse the concomitant tumor immunity but they did decrease the primary tumor growth rate (Fig. 2⇓A). In addition, the CT 26-specific IFN-γ responses of these day-28 splenocytes were similar to the splenocytes of day-7 primary tumor-bearing mice (day-7 splenocytes) and may be responsible for the concomitant tumor immunity (Fig. 2⇓B). These results indicate that mice, even after the loss of concomitant tumor immunity, retain substantial tumor-inhibiting ability. Different impacts of splenocytes from day-28 tumor-bearing mice on concomitant tumor immunity. A, On day 0, CT 26 cells (1 × 105) were inoculated s.c. onto the left flanks of naive mice. On day 6, splenocytes (2 × 107) harvested from day-28 tumor-bearing mice were injected i.v. into some of these mice. On day 7, more CT 26 cells (1 × 105) were inoculated on the contralateral sides of these mice. Growth pattern of the secondary tumor in mice with (○) or without (▵) adoptive transfer of splenocytes (right) is shown. Mice without previous tumor challenge (solid line) and without adoptive transfer (▵) are indicated. Growth pattern of primary tumor with (○) or without (▪) adoptive transfer of splenocytes (left) is shown. B, Splenocytes (5 × 106 cells/ml) harvested from naive, day-7, and day-28 tumor-bearing mice, were restimulated in vitro by coculture with different doses of irradiated CT 26 tumor cells. At 48 h after, supernatants were collected and assayed for IFN-γ production by ELISA. C and D, CD4+ T cells and CD8+ T cells sorted from spleens of 28-day tumor-bearing mice by FASCAria. Similar to A on day 0, CT 26 cells (1 × 105) were inoculated s.c. on left flanks of naive mice. On day 6, 1.5 × 107 CD4+ T cells, 5 × 106 CD8+ T cells, or 2 × 107 splenocytes from day-28 tumor-bearing mice were injected through tail veins of the mice. C, Growth pattern of primary tumor. Adoptive transfer of splenocytes (○), adoptive transfer of CD4+ T cells (□), and adoptive transfer of CD8+ T cells (▵) are shown, some (dotted line) without cell transfer (▿). D, Growth pattern of secondary tumor. Adoptive transfer of splenocytes (○), adoptive transfer of CD4+ T cells (□), and adoptive transfer CD8+ T cells (▵) are shown, some without cell transfer (▿) but with previous tumor challenge or without previous tumor inoculation or cell transfer as tumor-growth control. Results shown are mean ± SEM for n = 5 mice in each group and are representative of three experiments. ∗, p < 0.05 for statistical analysis with Mann-Whitney U test. We fractioned day-28 splenocytes to study the impact of different T cell populations, from day-28 tumor-bearing mice, on tumor growth. Observations suggest that CD8+ T cells from day-28 splenocytes partially retard primary tumor growth (Fig. 2⇑C), whereas CD4+ T cells from day-28 splenocytes inhibit concomitant tumor immunity (Fig. 2⇑D). It is intriguing that CD8+ T cells from mice that lose concomitant tumor immunity can restrain tumor growth. We investigated phenotype changes in CD8+ T cells in different compartments of tumor-bearing mice. As shown in Fig. 3⇓A, the percentage of activated CD8+ T cells (defined as CD25+, CD44high, or CD69+) increased mainly in draining lymph nodes and the spleen but less in nondraining lymph nodes of tumor-bearing mice when compared with naive mice. CD8+ T cells in TILs were also highly activated and showed strong effector molecule expression, including FasL, perforin, and granzyme B (Fig. 3⇓B). Furthermore, the percentage of these activated and functionally mature CD8+ T cells was higher in day-28 tumor-bearing mice than day-7 tumor-bearing mice (Fig. 3⇓B). Competent tumor-eradication potency of CD8+ T cells from mice that have lost concomitant tumor immunity. A, Expression of activation markers (CD25, CD44, CD69) on CD8+ T cells from immune organs of naive mice, day-7 or day-28 tumor-bearing mice. B, Expression profile of activation markers and effector molecules (CD25, CD44, CD69, FasL, perforin, granzyme B) of tumor-infiltrated CD8+ T cells (TIL) from day-7 and day-28 tumor-bearing mice. C, Estimation of IFN-γ production by CD8+ T cells purified through AutoMACS from spleens of naive mice, 7-day or 28-day tumor-bearing mice after stimulation with different doses of irradiated CT 26 cells by ELISA. D, On day 0, 1 × 105 CT 26 cells were inoculated. On day 1, no cell transfer (group A) or with a different number of splenic CD8+ T cells (group B, 0.3 × 106; group C, 1 × 106; and group D, 3 × 106) purified from day-28 tumor-bearing mice were i.v. injected. Growth patterns of each group were measured. E, CD8+ T cells (1 × 106 per mice) from naive, 7-day, or 28-day tumor-bearing mice were adoptively transferred to the mice 1 day after CT 26 tumor (1 × 105 cells) inoculation. Mice without adoptive transfer of additional CD8+ T cells were used as controls. Data represent mean ± SEM of n = 5 mice. Results are representative of three experiments. ∗, p < 0.05 for statistical analysis with Mann-Whitney U test and ∗∗, p < 0.01. To corroborate our findings concerning functional capabilities of CD8+ T cells in vitro and in vivo, these cells were sorted from day-7 and day-28 spleens of tumor-bearing mice; in vitro CT 26-specific IFN-γ secretion was significantly enhanced in CD8+ T cells of day-28 spleens, rather than day-7 spleens or naive CD8+ T cells (Fig. 3⇑C). The in vivo tumor-inhibiting ability of cells was then evaluated by adoptively transferring these cells to naive mice, 1 day after primary CT 26 tumor challenge. As shown in Fig. 3⇑D, CD8+ T cells from day-28 splenocytes could inhibit the growth of tumor in a dose-dependent manner. Interestingly, CD8+ T cells from day-28 spleens were the most potent in inhibiting tumor growth when compared with CD8+ T cells from day-7 spleens or naive CD8+ T cells (Fig. 3⇑E). Taken together, these results demonstrate that the CD8+ T cells that lost concomitant tumor immunity retained tumor-inhibiting potency. It seems that CD8+ T cells from tumor-bearing mice are potent inhibitors of primary tumor growth, but why do these mice lose concomitant tumor immunity? We enumerated Treg cells (CD4+CD25+Foxp3+ T cells) in different areas of tumor-bearing mice and compared them with those from naive mice. The absolute number of Treg cells were increased in the spleen and draining lymph nodes but not in nondraining lymph nodes in tumor-bearing mice (Fig. 4⇓A). We sorted CD8+ T cells (day-28 CD8+ T cells), CD4+CD25− T cells (day-28 CD4+CD25− T cells) and CD4+CD25+ T cells (day-28 Treg cells) from day-28 tumor-bearing mice spleens. As shown in Fig. 4⇓B, the day-28 CD4+CD25+ T cells had inhibitory capability, whereas day-28 CD4+CD25− T cells had no additional effect on day-28 CD8+ T cells in terms of IFN-γ secretion. We cotransferred day-28 Treg cells or day-28 CD4+CD25− T cells with day-28 CD8+ T cells into naive mice and then challenged the mice with CT 26 tumor cells. As shown in Fig. 4⇓C, the day-28 Treg cells but not the day-28 CD4+CD25− T cells could reverse day-28 CD8+ T cell-mediated primary tumor suppression. Splenic CD4+CD25+Foxp3+ T cells from tumor-bearing mice diminishing tumor-inhibition potency of CD8+ T cells. A, Absolute number of Treg cells in spleen, draining lymph node or nondraining lymph node of naive mice, day-7 tumor-bearing mice, and 28-day tumor-bearing mice. Data represent mean ± SEM from n = 6 mice in each group. B, Splenic CD8+, CD4+CT25+, and CD4+CD25− T cells were purified from day-28 tumor-bearing mice. CD8+ T cells alone (group A), or together with CD4+CT25+ (group B) or CD4+CD25− T cells (group C) at a ratio of 1:0.5, were cocultured with irradiated CT 26 cells (1:0.01). Supernatants were harvested 48 h later and assayed for IFN-γ by ELISA. C, Tumors were inoculated on day 0. On day 1, different sorted cells from 28-day tumor-bearing mice like CD8+ T cells alone (1 × 106 per mice, group A), or together with CD4+CD25+ T cells (0.3 × 106 per mice, group B) or with CD4+CD25− T cells (0.3 × 106 per mice, group C) were adoptively transferred. Growth patterns of tumors are shown. Results are mean ± SEM for n = 4 mice and representative of three experiments. D, CD8+ T cells from day-28 tumor-bearing mice alone (group A) or mixed either with CD4+CD25+ T cells from naive mice (group B) or cells from day-28 tumor-bearing mice (group C) in different ratios were then stimulated in vitro with irradiated CT 26 tumor cells for 48 h. Supernatants were harvested and assayed for IFN-γ by ELISA. E, Growth patterns of tumors in mice that received tumor challenge on day 0 and received CD8+ T cells alone (1 × 106 per mice, group A), or together with day-28 CD4+CD25+ T cells (0.3 × 106 per mice, group B) or with naive CD4+CD25+ T cells (0.3 × 106 per mice, group C) on day 1 are shown. Mice that received tumor challenge but without any T cell transfer served as controls (group D). Results are mean ± SEM for n = 4 mice and representative of two experiments. ∗, p < 0.05 for statistical analysis with Mann-Whitney U test and ∗∗, p < 0.01. We further compared the suppression ability of naive Treg cells and day-28 Treg cells. 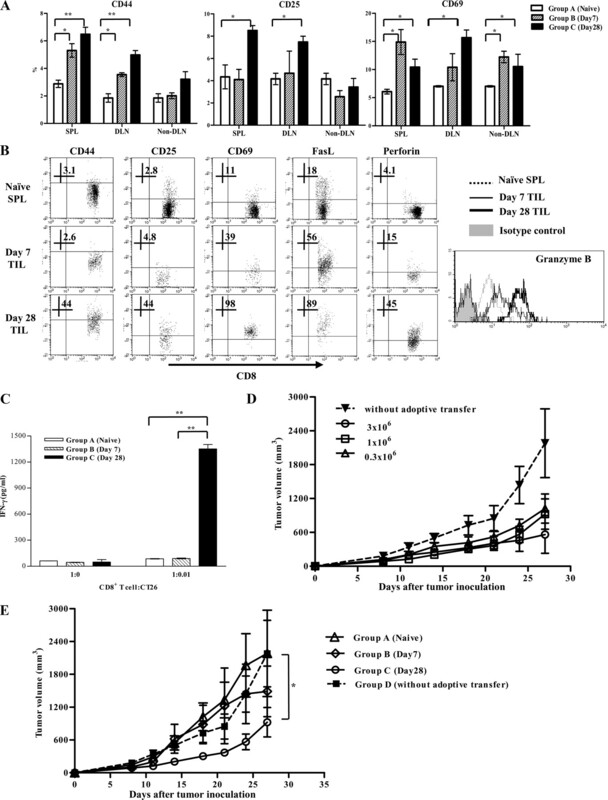 The data show the suppression effects of day-28 Treg cells on the in vitro tumor-specific IFN-γ secretion of day-28 CD8+ T cells to be more potent than in naive Treg cells (Fig. 4⇑D). The adoptive transfer studies by transferring different T cell populations into the naive mice 1 day after primary CT 26 tumor challenge also revealed that day-28 Treg cells exhibit more potent suppression effects than those of naive Treg cells on tumor-inhibiting ability of day-28 CD8+ T cells (Fig. 4⇑E). Day-28 Treg cells would appear more potent than naive Treg cells in terms of suppression of tumor inhibition imposed by day-28 CD8+ T cells. We examined the phenotypes of day-28 Treg cells and compared them with Treg cells from naive mice. As shown in Fig. 5⇓A, the expression of GITR, Lag-3, and CTLA-4 was increased in day-28 Treg cells when compared with naive Treg cells. The percentage of CD127-expressed Treg cells increased and CD62Lhigh Treg cells decreased in day-28 Treg cells as well. In addition, expression of effector molecules like FasL, granzyme B, perforin, and ICOS were increased in day-28 Treg cells (Fig. 5⇓A). A similar situation was found in Treg cells from TILs in day-28 tumor-bearing mice (Fig. 5⇓B). Expression of Foxp3, GITR, and CTLA-4 were higher in Treg cells from TILs than in naive Treg cells (Fig. 5⇓B). These observations imply that Treg cells in tumor-bearing mice were more activated than in naive mice. We analyzed the percentage of effector/memory Treg cells in tumor-bearing mice, defined as CD103+ Treg cells, as suggested by Huehn et al. (22). As shown in Fig. 5⇓C, during tumor progression, the percentage of CD103+ Treg cells increased rapidly in TILs and then in spleens of tumor-bearing mice. Effector molecules and inflamed tissue-homing chemokines like CCR3 and CCR5 were highly expressed in CD103+ Treg cells when compared with CD103− Treg cells, in both naive and tumor-bearing mice (Fig. 5⇓D). Treg cells from tumor-bearing mice express effector/memory phenotype. A and B, Expression levels of several surface molecules and effector molecules on CD4+Foxp3+ T cells from splenocytes (A) or TILs (B) from naive mice (naive Tregs) or day-28 tumor-bearing mice (28-day Tregs). Cells were gated on CD4+Foxp3+ population. Expressions of Foxp3, GITR, CTLA-4, and granzyme B are depicted as mean fluorescence intensity (MFI); others are depicted as a percentage. C, The percentage of CD103+ Treg cells (effector/memory Treg cells) in total Treg cells were measured in TILs and spleens of naive mice, day-7 tumor-bearing mice, and day-28 tumor-bearing mice. D, Different expression of effector molecules and chemokine receptors on CD4+CD103+Foxp3+ and CD4+CD103−Foxp3+ T cells from spleens of naive mice and day-28 tumor-bearing mice. Data are mean ± SEM of n = 4–5 mice. Results are representative of two to three independent experiments. ∗, p < 0.05 for statistical analysis with Mann-Whitney U test and ∗∗, p < 0.01. The increased effector/memory Treg cell counts in tumor-bearing mice imply that these cells might be responsible for the loss of concomitant tumor immunity. We sorted CD103+ Treg cells and CD103− Treg cells from day-28 splenocytes (Fig. 6⇓A). These cells were cotransferred with day-28 CD8+ T cells into naive mice and recipient mice were subsequently challenged with CT 26 tumor cells. As shown in Fig. 6⇓B, CD103+ Treg cells from day-28 splenocytes were more potent than CD103− Treg cells from day-28 splenocytes in suppressing day-28 CD8+ T cell tumor-inhibition potency. We inoculated naive mice with CT 26 tumor cells (for primary tumor, day 0) and after 6 days, we adoptively transferred day-28 CD103+ Treg cells or day-28 CD103− Treg cells (day 6). Secondary CT 26 tumor cells were inoculated 1 day later (for secondary tumor, day 7). Results showed that CD103+ Treg cells were again more potent than CD103− Treg cells in inhibiting the concomitant tumor immunity (Fig. 6⇓C). Therefore, development of effector/memory Treg cells seems associated with an overall increase in Treg cell counts, attributed to inhibition of concomitant tumor immunity. CD103+ Treg cells from tumor-bearing mice inhibit concomitant tumor immunity. A, CD4+CD103+CD25+ T cells and CD4+CD103−CD25+ T cells were purified from spleens of day-28 tumor-bearing mice and checked for Foxp3 expression. B, Growth patterns of tumors were measured in mice that received tumor challenge on day 0. T cell transfer is measured on day 1. A total of 1 × 106 day-28 CD8+ T cells alone (group A), or together with 0.03 × 106 day-28 CD4+CD103+CD25+ T cells (group B) or with 0.03 × 106 day-28 CD4+CD25+CD103− T cells (group C) were transferred to each mouse. Control mice were inoculated with tumor cells but without adoptive transfer of T cells (group D). Results are expressed as mean ± SEM for n = 4 mice and representative of two experiments. C, On day 0, primary tumors (1 × 105 CT 26 cells) were inoculated s.c. on the left flanks of naive mice. On day 6, CD4+CD25+CD103+ T cells (0.03 × 106 per mice) from day-28 tumor-bearing mice (group A) or CD4+CD25+CD103− T cells (0.03 × 106 per mice) from day-28 tumor-bearing mice (group B) or CD4+CD25− T cells (0.03 × 106 per mice) from day-28 tumor-bearing mice (group C) were adoptively transferred to these mice. On day 7, more CT 26 cells (1 × 105) were inoculated (secondary tumor) on the contralateral sides of these mice. Growth patterns of the secondary tumor were measured. Mice that received both first (for primary tumor) and second (for secondary tumor) tumor challenge without additional T cell transfer were considered controls for concomitant tumor immunity (group D). Mice only received one tumor challenged were counted as tumor growth controls (group E). Results are mean ± SEM for n = 4 mice and representative of two experiments. ∗, p < 0.05 for statistical analysis with Mann-Whitney U test ∗∗, p < 0.01. Concomitant tumor immunity was described decades ago in a series of elegant studies (1). Initially, this phenomenon seemed limited to tumors with high immunogenicity (7). However, recent literature has shown that tumors with low immunogenicity still possess concomitant tumor immunity if Treg cells are depleted (9). Concomitant tumor immunity seems a general phenomenon involving a large variety of murine tumors with different immunogenicities; Treg cells might play a significant role in inhibiting this phenomenon. In this study, concomitant tumor immunity was gradually lost as tumors progressed (Fig. 1⇑C). CD8+ T cells from mice that lost concomitant tumor immunity had the greatest tumor-inhibition potency (Figs. 2⇑ and 3⇑, D and E). Effector/memory Treg cells increased during this process (Fig. 5⇑B). The CD4+CD103+Foxp3+ T cells had greater perforin, granzyme B, and FasL expression, whereas CCR3/CCR5 were increased and CCR7/CD62L were decreased (Fig. 5⇑D). These cells accumulated initially in TILs and later accumulated in the spleen. These effector/memory Treg cells seem responsible for the loss of concomitant tumor immunity as the tumor progresses (Fig. 6⇑, B and C). The fact that CD8+ T cells from spleens of mice lacking concomitant tumor immunity retained the most potent antitumor immunity is intriguing but not unexpected. CD8+ T cells from tumor-bearing hosts have already been suspected to have impaired in tumor-eradication potency (3). A lot of effort has been made to augment tumor-specific CTL functions. 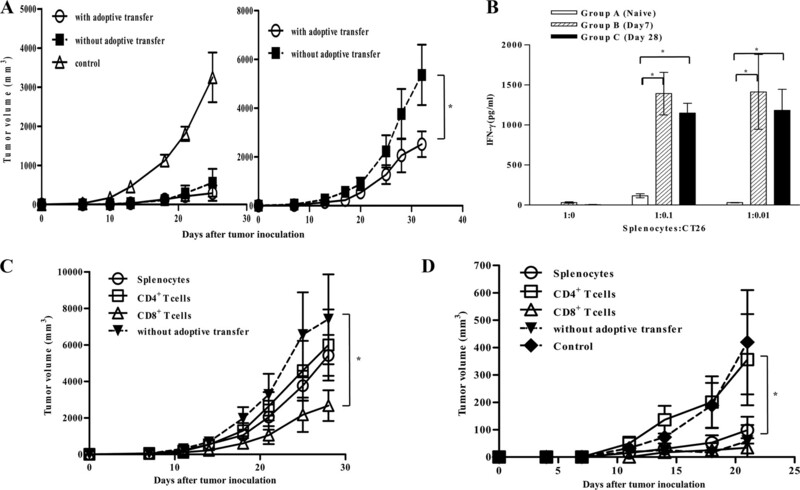 Strategies have included challenge with Ag-pulsed dendritic cell, in vitro transfer of expanded T cells harvested from TILs, transferring TILs with growth factors, and transfer of cytokine-activated T cells (10, 30, 31, 32, 33). However, responses have been unsatisfactory, which indicates that mechanisms of tumor escape might not involve the initial stage of T cell priming (34). In this study, splenic CD8+ T cells from mice devoid of concomitant tumor immunity efficiently inhibited tumor growth if these cells were adoptively transferred 1 day after tumor challenge to naive mice (Fig. 3⇑). These results are in line with the argument that the ability of a tumor to elude immune responses does not depend solely on CD8+ T cell priming inability. In line with previous reports, CD8+ tumor-infiltrating T cells harvested from the tumor site were activated and expressed an enormous amount of perforin/granzyme B, even though they could not eradicate/inhibit tumors (Fig. 3⇑B) (35, 36). The latter finding may be attributed to a defective microtubule-organizing center with defective lytic granule exocytosis (36). This result is also consistent with the notion that the tolerogenic tumor microenvironment is responsible for inactivation of the lytic function of TILs, though they are activated and expressed perforin/granzyme B (34). A lot of evidence has demonstrated that Treg cells are one of the key mechanisms involved when tumors elude immune responses and are one of the main obstacles to tumor immunotherapy (17, 37, 38, 39, 40). Our results indicate that Treg cells hinder concomitant tumor immunity, which is in line with previous reports (9). Our serial in vivo and in vitro studies demonstrate that Treg cells ameliorate tumor-bearing CD8+ T cell functions; this demonstration is most prominent in day-28 tumor-bearing mice. Interestingly, we also found CD103 to be highly expressed on the subgroup of Treg cells most potent in suppression of tumor-inhibition potency of CD8+ T cells. CD103 has been proposed as a marker of effector/memory Treg cells (22). Therefore, these effector/memory Treg cells can migrate to sites of tissue, and are unique in their capacity to mediate suppression of T cell activation for tissue protection (21). The roles of these effector/memory Treg cells in inhibition of immune responses have been demonstrated in several models, including colitis and in a graft-vs-host condition (32, 41, 42, 43). The evidence implies that these effector/memory Treg cells are responsible for damage control, which is one of the Treg cell functions proposed by Tang and Bluestone (44). In this study, these cells also seem involved in tumor protection. It is possible tumor cells themselves or the surrounding microenvironment could enhance attraction or development of these cells, which would protect the tumor from immune attack. It has been claimed that an integrin, CD103, is highly expressed on intraepithelial lymphocytes in the gut wall and other epithelial compartments, such as the skin, liver, and lung (45, 46). However, the tissue-tropism behavior of T cells, especially Treg cells, is also associated with chemokine receptor expression that includes CCR4 and CCR5 (11, 28, 46, 47, 48, 49). In the present study, inflammation-related chemokine receptors such as CCR3/CCR5 were highly expressed on these CD103+ Treg cells, especially in the tumor microenvironment (Fig. 5⇑D). This result further highlights the association of inflammation, tumors, and effector/memory Treg cell trafficking. In addition, these effector/memory Treg cells, which we found in our tumor model, more greatly express CTLA-4/GITR/Lag-3 and perforin/granzyme B/FasL (Fig. 5⇑A), which strongly supports the notion that these cells were activated with full effector molecules (22). The strong expression of perforin/granzyme B/FasL implies that Treg cell killing ability might be very important in the tumor microenvironment, which is in-line with a recent study that used granzyme B knockout mice in a tumor model (50). In conclusion, this study demonstrates that CD8+ T cells from mice that have lost concomitant tumor immunity still possess potent tumor-eradicating potency. Effector/memory Treg cells with CD103 expression gradually increased as the tumor progressed. These effector/memory Treg cells were responsible for repressing tumor-inhibiting CD8+ T cells and the subsequent loss of concomitant tumor immunity. ↵1 This work was supported by NMRP Genome Projects 93-2314-B-182-023 and 95-2314-B-182-052 from the National Science Council, Taiwan, and by CMRPG 34033x, 361321, and 33007 from Chang Gung Memorial Hospital Medical Research Project Fund. ↵3 Abbreviations used in this paper: Treg, regulatory T; TIL, tumor-infiltrating lymphocyte; GITR, glucocorticoid-induced TNFR; FasL, Fas ligand. Ehrlich, P.. 1906. Collected Studies on Immunity J. Wiley & Sons. London, U.K..
Bashford, E., J. Murray, M. Haaland. 1908. Resistance and susceptibility to inoculated cancer. E. Bashford, ed. Third Scientific Report on the Investigations of the Imperial Cancer Research Fund 359 Taylor & Francis, London, U.K..
Berendt, M. J., R. J. North, D. P. Kirstein. 1978. The immunological basis of endotoxin-induced tumor regression: requirement for a pre-existing state of concomitant antitumor immunity. J. Exp. Med. 148: 1560-1569. Deckers, P. J., B. W. Edgerton, B. S. Thomas, Y. H. Pilch. 1971. 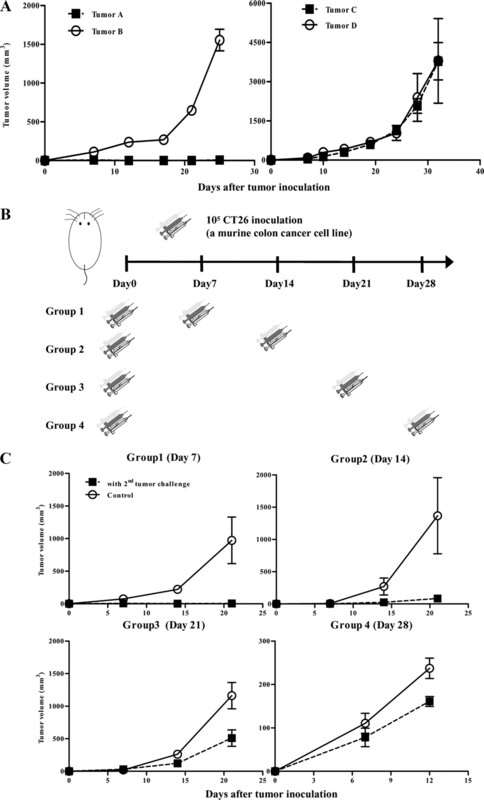 The adoptive transfer of concomitant immunity to murine tumor isografts with spleen cells from tumor-bearing animals. Cancer Res. 31: 734-742. Howell, S. B., J. H. Dean, L. W. Law. 1975. Defects in cell-mediated immunity during growth of a syngeneic simian virus-induced tumor. Int. J. Cancer 15: 152-169. Zarling, J. M., S. S. Tevethia. 1973. Transplantation immunity major persistence and immunity. Nature 420: 502-507. North, R. J., I. Bursuker. 1984. Generation and decay of the immune response to a progressive fibrosarcoma: I. Ly-12-suppressor T cells down-regulate the generation of Ly-1–2 effector T cells. J. Exp. Med. 159: 1295-1311. DiGiacomo, A., R. J. North. 1986. 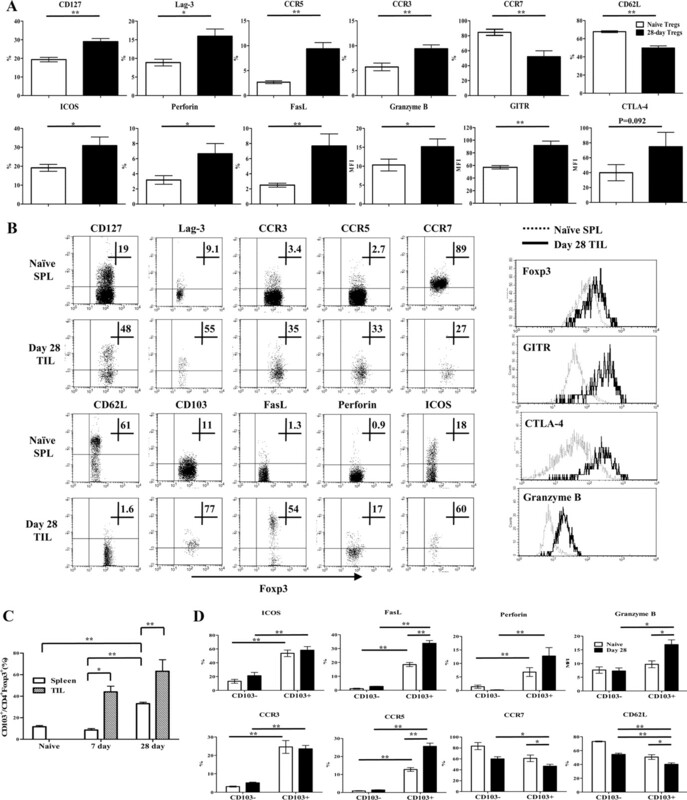 T cell suppressors of antitumor immunity: the production of Ly-1-,2 suppressors of delayed sensitivity precedes the production of suppressors of protective immunity. J. Exp. Med. 164: 1179-1192. Turk, M. J., J. A. Guevara-Patino, G. A. Rizzuto, M. E. Engelhorn, A. N. Houghton. 2004. Concomitant tumor immunity to a poorly immunogenic melanoma is prevented by regulatory T cells. J. Exp. Med. 200: 771-782. Curiel, T. J.. 2007. Tregs and rethinking cancer immunotherapy. J. Clin. Invest. 117: 1167-1174. Curiel, T. J., G. Coukos, L. Zou, X. Alvarez, P. Cheng, P. Mottram, E. Evdemon-Hogan, J. R. Conejo-Garcia, L. Zhang, M. Burow, et al 2004. Specific recruitment of regulatory T cells in ovarian carcinoma fosters immune privilege and predicts reduced survival. Nat. Med. 10: 942-949. Bates, G. J., S. B. Fox, C. Han, R. D. Leek, J. F. Garcia, A. L. Harris, A. H. Banham. 2006. Quantification of regulatory T cells enables the identification of high-risk breast cancer patients and those at risk of late relapse. J. Clin. Oncol. 24: 5373-5380. Kobayashi, N., N. Hiraoka, W. Yamagami, H. Ojima, Y. Kanai, T. Kosuge, A. Nakajima, S. Hirohashi. 2007. FoxP3+ regulatory T cells affect the development and progression of hepatocarcinogenesis. Clin. Cancer Res. 13: 902-911. Steitz, J., J. Bruck, J. Lenz, J. Knop, T. Tüting. 2001. Depletion of CD25+CD4+ T cells and treatment with tyrosinase-related protein 2-transduced dendritic cells enhance the interferon α-induced, CD8+ T-cell-dependent immune defense of B16 melanoma. Cancer Res. 61: 8643-8646. Sutmuller, R. P. M., L. M. van Duivenvoorde, A. van Elsas, T. N. M. Schumacher, M. E. Wildenberg, J. P. Allison, R. E. M. Toes, R. Offringa, C. J. M. Melief. 2001. Synergism of cytotoxic T lymphocyte-associated antigen 4 blockade and depletion of CD25+ regulatory T cells in antitumor therapy reveals alternative pathways for suppression of autoreactive cytotoxic T lymphocyte responses. J. Exp. Med. 194: 823-832. Chen, M. L., M. J. Pittet, L. Gorelik, R. A. Flavell, R. Weissleder, H. von Boehmer, K. Khazaie. 2005. Regulatory T cells suppress tumor-specific CD8 T cell cytotoxicity through TGF-β signals in vivo. Proc. Natl. Acad. Sci. USA 102: 419-424. Nishikawa, H., E. Jäger, G. Ritter, L. Old, S. Gnjatic. 2005. CD4+CD25+ regulatory T cells control the induction of antigen-specific CD4+ helper T cell responses in cancer patients. Blood 106: 1008-1011. Stephens, G. L., J. Andersson, E. M. Shevach. 2007. Distinct subsets of FoxP3+ regulatory T cells participate in the control of immune responses. J. Immunol. 178: 6901-6911. Huehn, J., J. C. U. Siegmund, C. Lehmann, U. Siewert, M. Haubold, G. F. Feuerer, J. Debes, O. Lauber, G. K. Frey, U. Przybylski, et al 2004. Developmental stage, phenotype, and migration distinguish naive- and effector/memory-like CD4+ regulatory T cells. J. Exp. Med. 199: 303-313. Liyanage, U. K., T. T. Moore, H.-G. Joo, Y. Tanaka, V. Herrmann, G. Doherty, J. A. Drebin, S. M. Strasberg, T. J. Eberlein, P. S. Goedegebuure, D. C. Linehan. 2002. Prevalence of regulatory T cells is increased in peripheral blood and tumor microenvironment of patients with pancreas or breast adenocarcinoma. J. Immunol. 169: 2756-2761. Sato, E., S. H. Olson, J. Ahn, B. Bundy, H. Nishikawa, F. Qian, A. A. Jungbluth, D. Frosina, S. Gnjatic, C. Ambrosone, et al 2005. Intraepithelial CD8+ tumor-infiltrating lymphocytes and a high CD8+/regulatory T cell ratio are associated with favorable prognosis in ovarian cancer. Proc. Natl. Acad. Sci. USA 102: 18538-18543. Mantovani, A., P. Romero, A. K. Palucka, F. M. Marincola. 2008. Tumour immunity: effector response to tumour and role of the microenvironment. Lancet 371: 771-783. Borrello, M. G., L. Alberti, A. Fischer, D. D. Innocenti, C. Ferrario, M. Gariboldi, F. Marchesi, P. Allavena, A. Greco, P. Collini, et al 2005. Induction of a proinflammatory program in normal human thyrocytes by the RET/PTC1 oncogene. Proc. Natl. Acad. Sci. USA 102: 14825-14830. Mantovani, A., P. Allavena, A. Sica, F. Balkwill. 2008. Cancer-related inflammation. Nature 454: 436-444. Zhao, D., C. Zhang, T. Yi, C.-L. Lin, I. Todorov, F. Kandeel, S. Forman, D. Zeng. 2008. In vivo activated CD103+CD4+ regulatory T cells ameliorate ongoing chronic graft-versus-host disease. Blood 112: 2129-2138. Cavassani, K. A., A. P. Campanelli, A. P. Moreira, J. O. Vancim, L. H. Vitali, R. C. Mamede, R. Martinez, J. S. Silva. 2006. Systemic and local characterization of regulatory T cells in a chronic fungal infection in humans. J. Immunol. 177: 5811-5818. Nestle, F. O., S. Alijagic, M. Gilliet, Y. Sun, S. Grabbe, R. Dummer, G. Burg, D. Schadendorf. 1998. Vaccination of melanoma patients with peptide- or tumor lysate-pulsed dendritic cells. Nat. Med. 4: 328-332. Rosenberg, S. A., P. Spiess, R. Lafreniere. 1986. A new approach to the adoptive immunotherapy of cancer with tumor-infiltrating lymphocytes. Science 233: 1318-1321. Rosenberg, S. A., B. S. Packard, P. M. Aebersold, D. Solomon, S. L. Topalian, S. T. Toy, P. Simon, M. T. Lotze, J. C. Yang, C. A. Seipp, et al 1988. Use of tumor-infiltrating lymphocytes and interleukin-2 in the immunotherapy of patients with metastatic melanoma: a preliminary report. N. Engl. J. Med. 319: 1676-1680. Pardoll, D. M.. 1998. Cancer vaccines. Nat. Med. 4: 525-531. Frey, A. B., N. Monu. 2006. Effector-phase tolerance: another mechanism of how cancer escapes antitumor immune response. J. Leukocyte Biol. 79: 652-662. Radoja, S., M. Saio, A. B. Frey. 2001. CD8+ Tumor-infiltrating lymphocytes are primed for Fas-mediated activation-induced cell death but are not apoptotic in situ. J. Immunol. 166: 6074-6083. Radoja, S., M. Saio, D. Schaer, M. Koneru, S. Vukmanovic, A. B. Frey. 2001. CD8+ Tumor-infiltrating T cells are deficient in perforin-mediated cytolytic activity due to defective microtubule-organizing center mobilization and lytic granule exocytosis. J. Immunol. 167: 5042-5051. Zou, W.. 2005. Immunosuppressive networks in the tumor environment and their therapeutic relevance. Nat. Rev. Cancer 5: 263-274. Pardoll, D. M.. 2001. Immunology, stress, NK receptors, and immune surveillance. Science 294: 534-536.
van Elsas, A., R. P. M. Sutmuller, A. A. Hurwitz, J. Ziskin, J. Villasenor, J.-P. Medema, W. W. Overwijk, N. P. Restifo, C. J. M. Melief, R. Offringa, J. P. Allison. 2001. Elucidating the autoimmune and antitumour effector mechanisms of a treatment based on cytotoxic T lymphocyte antigen-4 blockade in combination with a B16 melanoma vaccine: comparison of prophylaxis and therapy. J. Exp. Med. 194: 481-489. Yu, P., Y. Lee, W. Liu, T. Krausz, A. Chong, H. Schreiber, Y. X. Fu. 2005. Intratumour depletion of CD4+ cells unmasks tumour immunogenicity leading to the rejection of late-stage tumours. J. Exp. Med. 201: 779-791. Suffia, I., S. K. Reckling, G. Salay, Y. Belkaid. 2005. A role for CD103 in the retention of CD4+CD25+ Treg and control of Leishmania major infection. J. Immunol. 174: 5444-5455. Lin, C. Y., M. C. Tsai, C. T. Huang, C. W. Hsu, S. C. Tseng, I. F. Tsai, Y. C. Chen, C. T. Yeh, I. S. Sheen, R. N. Chien. 2007. Liver injury is associated with enhanced regulatory T-cell activity in patients with chronic hepatitis B. J. Viral. Hepatol. 14: 503-511. Annacker, O., J. L. Coombes, V. Malmstrom, H. H. Uhlig, T. Bourne, B. Johansson-Lindbom, W. W. Agace, C. M. Parker, F. Powrie. 2005. Essential role for CD103 in the T cell-mediated regulation of experimental colitis. J. Exp. Med. 202: 1051-1061. Tang, Q., J. A. Bluestone. 2008. The Foxp3+ regulatory T cell: a jack of all trades, master of regulation. Nat. Immunol. 9: 239-244. Cerf-Bensussan, J. A., A. Jarry, N. Brousse, B. Lisowska-Grospierre, D. Guy-Grand, C. Griscelli. 1987. A monoclonal antibody (HML-1) defining a novel membrane molecule present on human intestinal lymphocytes. Eur. J. Immunol. 17: 1279-1285. Sather, B. D., P. Treuting, N. Perdue, M. Miazgowicz, J. D. Fontenot, A. Y. Rudensky, D. J. Campbell. 2007. Altering the distribution of Foxp3+ regulatory T cells results in tissue-specific inflammatory disease. J. Exp. Med. 204: 1335-1347. Lee, I., L. Wang, A. D. Wells, A. D. Wells, M. E. Dorf, E. Ozkaynak, W. W. Hancock. 2005. Recruitment of Foxp3+ T regulatory cells mediating allograft tolerance depends on the CCR4 chemokine receptor. J. Exp. Med. 201: 1037-1044. Wysocki, C. A., Q. Jiang, A. Panoskaltsis-Mortari, P. A. Taylor, K. P. McKinnon, L. Su, B. R. Blazar, J. S. Serody. 2005. Critical role for CCR5 in the function of donor CD4+CD25+ regulatory T cells during acute graft-versus-host disease. Blood 106: 3300-3307. Yurchenko, E., M. Tritt, V. Hay, E. M. Shevach, Y. Belkaid, C. A. Piccirillo. 2006. CCR5-dependent homing of naturally occurring CD4+ regulatory T cells to sites of Leishmania major infection favors pathogen persistence. J. Exp. Med. 203: 2451-2460. Cao, X., S. Cai, T. Fehniger, J. Song, L. Collins, D. Piwnica-Worms, T. Ley. 2007. Granzyme B and perforin are important for regulatory T cell-mediated suppression of tumor clearance. Immunity 27: 635-646.